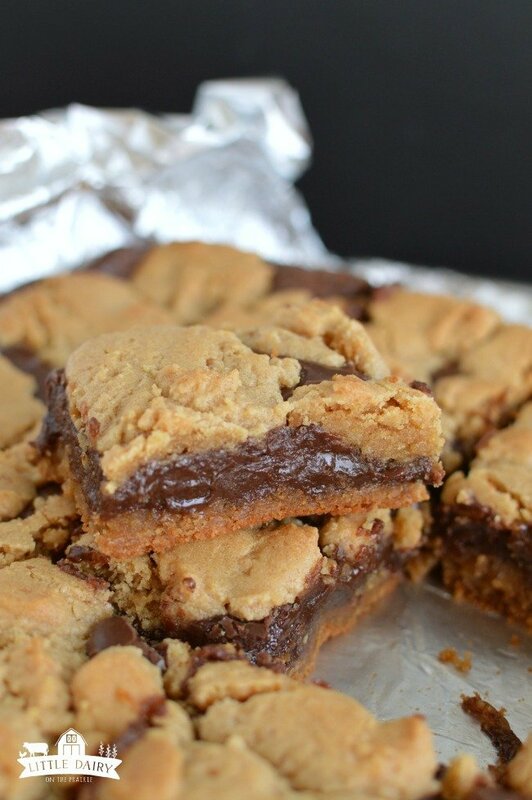 You guys these Peanut Butter Fudge Cookie Bars are the out of this world! 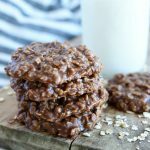 It’s pretty hard to go wrong when you combine peanut butter and chocolate together in any form but these babies are so decadent! Let’s talk about bar cookies for a second. Bar cookies are seriously one of my favorite things. They are quicker to make than dropping or shaping cookies. 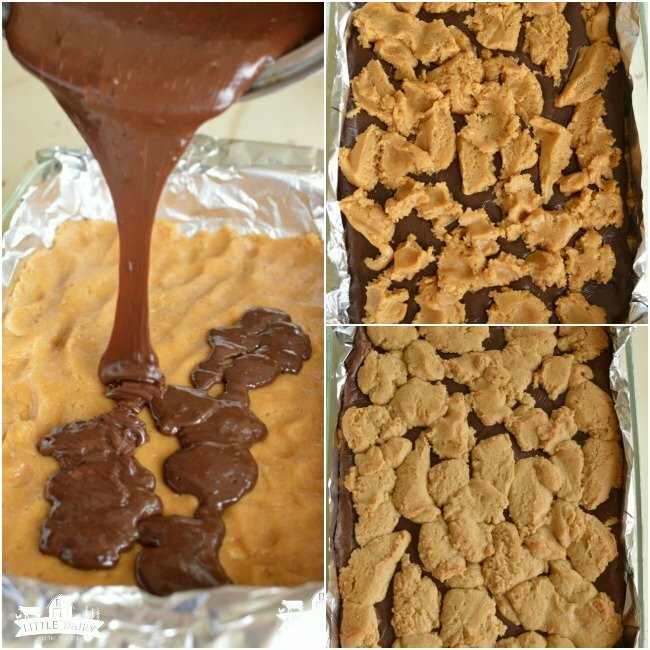 For my Peanut Butter Fudge Cookie Bars I used a cookie mix, you could also use one of those tubes of store bought cookie dough too, which would make this process even faster! Or if you are really ambitious you could make your own homemade peanut butter cookies. Add butter, sweetened condensed milk, and chocolate chips to a saucepan. Cook over medium heat until melted and combined. Mix peanut butter cookies according to package instructions or use 2 tubes of store bought peanut butter cookie dough. Spread half of the cookie dough in the bottom of a greased 9 x 13 baking pan. Pour chocolate fudge sauce over bottom layer of cookie dough. Drop little remaining cookie dough in Tablespoon sized pieces (or whatever size you want) over fudge layer. 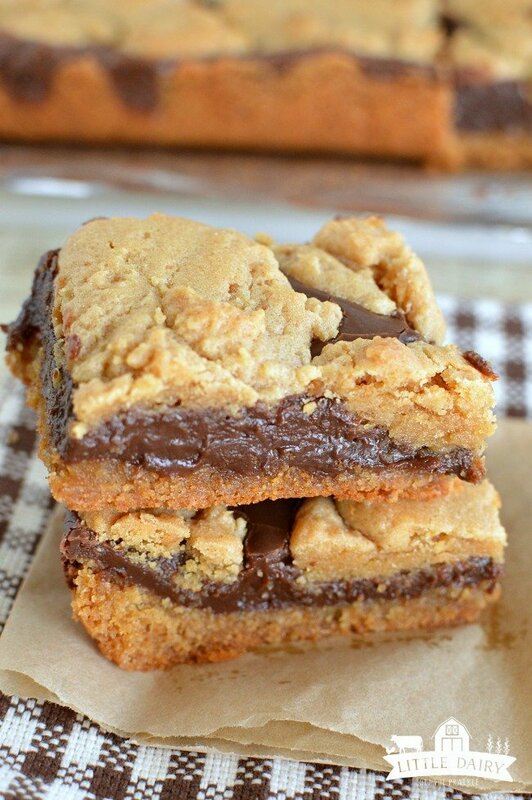 Bake Peanut Butter Fudge Cookie Bars. 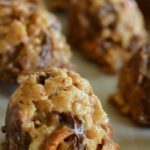 If you love Oatmeal Fudge Jumbles you are going to fall head over heels in love with the addition of peanut butter in these! 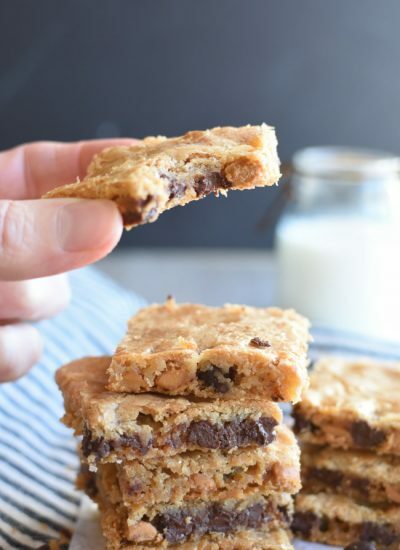 It’s pretty much the same bar cookie in a quicker to make and oh so addicting way! 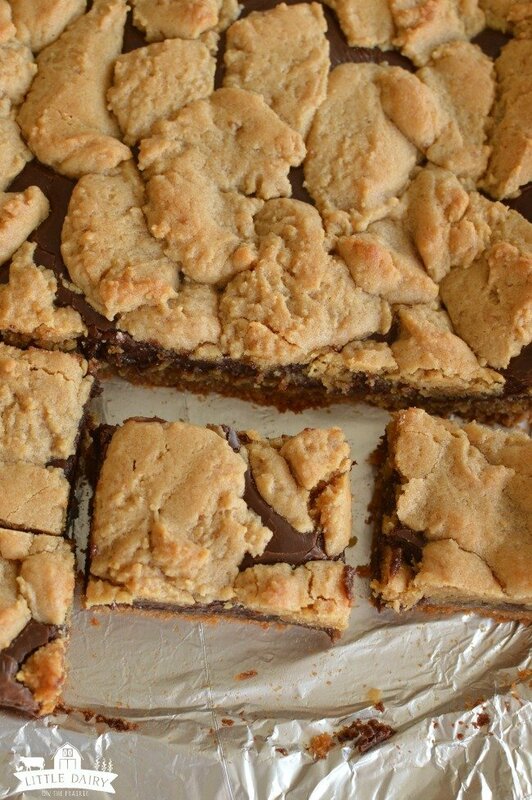 If you have ten extra minutes today I think you should spend it making Peanut Butter Fudge Cookie Bars! Trust me…you won’t regret it! Preheat oven to 350 degrees. Line a 9 x 13 baking pan with aluminum foil. Spray with nonstick baking spray. Mix cookie dough according to package directions. Spread ½ of it on the bottom of prepared baking pan. 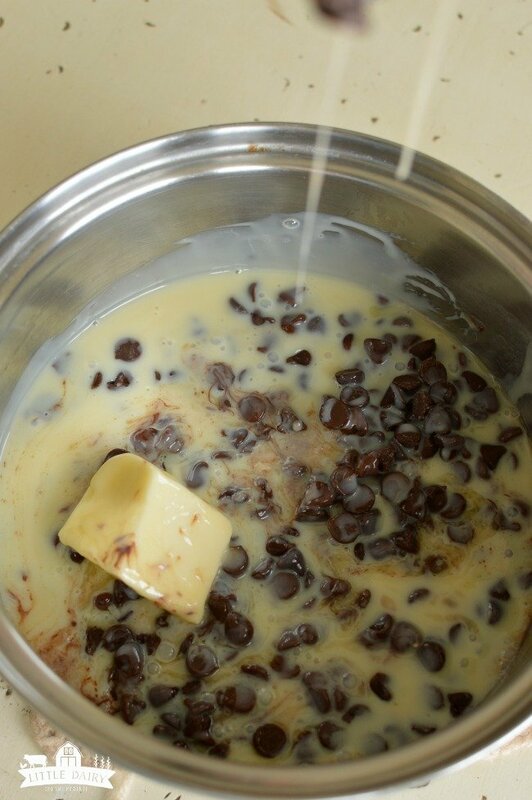 Add sweetened condensed milk, butter, and chocolate chips to a saucepan. Cook over medium heat until all ingredients are melted and combined. Add vanilla. Pour over first layer of peanut butter cookie dough. Drop remaining cookie dough over fudge layer. I like to drop it in about Tablespoon sized pieces. You can flatten the pieces out before setting them on the fudge layer if you like. Don’t worry about having spots of the fudge layer that are still exposed. It will be just fine! Thank you for the shortcut ideas! Sometimes you need to satisfy a craving and you need it NOW!! They look awesome and can’t wait to try them. Haha! I need to satisfy my sweet tooth cravings almost all day everyday! And yes…shortcuts are my life! Can’t wait to get my hands on one of these! Yum!! I think everyone should make a batch ASAP! I just discovered your blog and it is amazing! So professional looking! Your recipes look amazing and I might just get excited about cooking again if I tune into your blog! I’m glad you found me Tammy! Thanks for the kind compliments! Almost all of my recipes are quick and easy to make using only a few ingredients because that’s what my life requires! I hope you find a few recipes you love! Oh my goodness, these are SO incredible!! Thanks! They are a huge hit when I share them at parties! Holy smokes! These look so fudgy! I can’t resist fudgy…pair it with peanut butter and I’m hopeless! That fudge layer is TO DIE FOR! 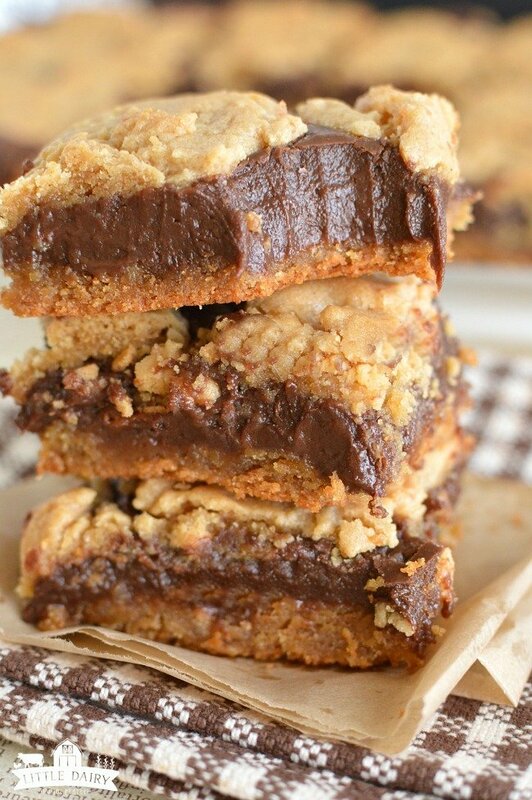 That fudge layer would be divine on it’s own…but sandwiched between peanut butter cookies…even better! I cant seem to find the amount of ingredients for fudge sause ? Help? 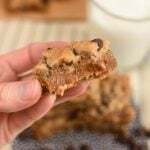 Here’s the link to the printable recipe which includes ingredients and directions; https://www.littledairyontheprairie.com/peanut-butter-fudge-cookie-bars/2/. 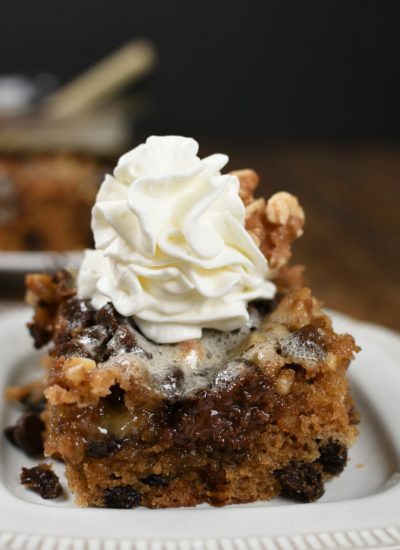 The fudge layer includes sweetened condensed milk, chocolate chips, butter, and vanilla. The directions for the fudge layer begin on number 3 in the instructions portion of the recipe. Let me know if you can’t find it! 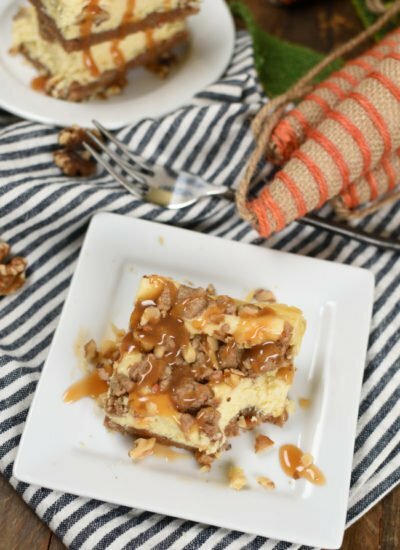 I’m pretty sure you are going to love these bars! That layer of fudge is calling out to me. I could nibble on these all day long. I have to hide them from myself or I would devour all of them! These look amazing! I’d prefer to make my own peanut butter cookie dough, I’m a make it all from scratch kind of gal. Have you tried that before?? How many cups of cookie dough would you say is in a store mix? Homemade cookie dough would be fantastic in these! I’m not exactly sure how many cups are in one of those little packages/tubes of cookie dough. I used two packages which would have made a total of 36 cookies. Maybe that will give you a guide for finding a recipe that would be about equal in portion. I’m guessing it was about 5 cups of cookie dough in all. Hopefully that helps! Sorry to hear about your dad! Hugs! He should easily be able to gain weight eating these! And they are worth every bite! Where are the measurements for this cookie bar? You might need those right? At the bottom of the page there is a grey box that says something like “click here for the recipe”. Clicking it will take you to the next page with the printable recipe! Let me know if you can’t find it! I am unable to see any measurements or temperatures or time at all – I checked several times ???? Hi Micky. Sorry you are having trouble finding the printable recipe. If you scroll to the very bottom of the page there is a graphic that says something like “click here for the recipe”. If you click that it will take you to the next page and the printable recipe will be right there. Let me know if you are still having trouble finding it and I will send you the direct link to the second page! These bars are worth the hassle! Would love to make these but don’t see the measurements for fudge ingredients.. Sorry for the confusion. I’m learning that I need to put the entire post including the recipe on one page. At the bottom of the first page there is a grey box that says something like click here for the recipe. If you click that box it will take you to the second page where there is a printable recipe that includes ingredients, amounts, and directions. Let me know if it’s still not there and I’ll make sure you get a copy of the recipe! Where are the specific ingredient amounts? If you click on the grey box at the bottom of the first page it will take you to the second page. The second page has a printable recipe with the exact ingredients, amounts, and instructions! Let me know if you can’t find it and I’ll make sure you I get it to you! I sent you an email. If you click on the grey box at the bottom of the first page of this post it will take you directly to the next page with the printable recipe! If you click on the grey box that says something like “Click here for the recipe” it should take you straight to a printable recipe. If it doesn’t work for you let me know and I’ll be sure to get it to you! There is a gray box at the bottom of the first page. It says something like “click here for the recipe”. It should take you to a printable recipe. If it doesn’t let me know and I’ll be sure to get it to you! And so. Where’s the recipe? Anyone know? Hi Dawn! 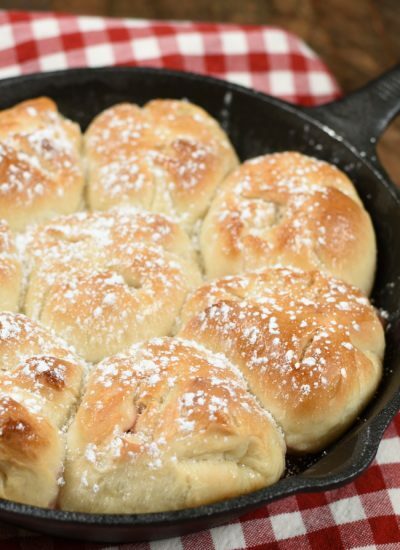 If you scroll to the bottom of the page there is a button that says something like click here for the recipe! If it doesn’t work for you let me know and I’ll be sure to get it to you! There used to be a gray box at the bottom that said something like “click here for the recipe”. I just edited that post so it’s all on the same page. If the printable recipe still isn’t showing up for you let me know and I’ll be sure to get it to you! Enjoy! Hi! How should I store these? In refrigerator or in an air tight container???? To be honest with you my boys gobble these up so fast I rarely need to store them for longer than a day! That’s the benefits of living with boys! Ha! I store them in an airtight container, not in the refrigerator! Enjoy! Just made these for a work party. Oh my gosh, so so SO good! I had to bake mine about 35 minutes but I chalk that up to oven differences. They were perfect. Thanks so much! Will be making them again I’m sure! Hi Amy! I bet your office is in love with you! I’m glad you all enjoyed them! Just discovered your blog & made these to thank my friend for dog sitting. Needless to say she’s already offered to watch the pup again in exchange for more yummy baked goods. SO easy & so good! Yay! 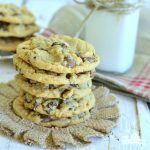 Cookies are always a great way to make someone feel appreciated and special! Sounds like they were a hit!